We have tried floss, thread, I can't even get a tiny needle through the hole can someone please help me figure out how to attach the wrist strap through the camera. 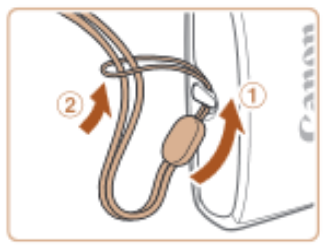 To install the wrist strap, you'll want to thread the small end of the wrist strap through the strap mount, then pull the large end through the small loop, as shown below. If you encounter difficulty threading the small end through, try making a "leader" out of something you may have nearby. You can use a small bit of monofilament (fishing) line or even dental floss. Just bend the line so that it's pulling the small end of the wrist strap. Next, twist the ends together then thread them through the strap mount. Once it's through, you should be able to pull the small end of the wrist strap through the strap mount, too. The procedure for attaching the strap to the camera is explained below. Thread the end of the strap through the strap hole ( ), and then pull the other end of the strap through the loop on the threaded end ( ). I'm having the same issue, too. To the point I wish it wasn't too late for me to return the camera to the store, but I waited until closer to my vacation to mess with it. The picture shows the metal look on the camera going across 90-degrees from what it actually is oriented on the camera. Had the loop been as shown in the picture you provided, it may be easier. As it is, it's going lengthwise, and the angle to go down between the loop and the rubber part means it can't go through the loop. Try fishing line? Yeah, still too tight an angle. Try dental floss? Yeah, doesn't work. Really poor engineering. Really poor. Like, really, really idiodic. I'm definately going to regift this, and let a friend or family member deal with the frustration. I won't buy a Canon product again.